Say what you like about Ed Miliband, at least he hasn’t descended into the morass of smears, accusations and counter-accusations that typify the Tory and Liberal Democrat election campaigns. Labour’s approach seems to be focused on the national situation, rather than local areas – perhaps Mr Miliband is leaving local campaigning to local representatives, who know exactly what they’re talking about. Good policy. By concentrating on the overarching issues – especially ahead of next week’s launch of the Coalition’s future legislative programme – he’s telling the country what Labour stands for, right now: Action on jobs, tax, housing and training, and cutting household bills. I don’t know about you but I’m in favour of all of that. Labour would provide a jobs guarantee for the long-term unemployed. People out of work would be obliged to take up those jobs (which might seem draconian, but remember, these people have been out of work for a long time and their pay would be more than the benefits they receive) and the £1 billion costs would be funded by reversing the government’s decision to stop tax relief on pension contributions for people earning over £150,000 being limited to 20 per cent. Labour would re-introduce the 10p tax band and cut VAT temporarily, freeing up the money supply to pump much-needed life into the national economy. Mr Miliband said the Coalition’s attempt at trickle-down economics was failing badly, and he was right – trickle-down is a proven falsehood. And Labour would cut energy bills and crack down on rogue landlords, putting more cash in the wallets of the people who actually spend their money. Of course, the Conservatives reacted predictably by complaining that the plans mean more spending, borrowing and debt – completely overlooking the fact that their own policies have increased borrowing by £245 billion since 2010. The World At One’s Martha Kearney tried to tackle Mr Miliband about this, but ended up making herself look a little foolish. While Miliband patiently tried to explain that investment now would bring growth in the medium term, cutting future borrowing, she seem to expect him to wave a magic wand – a Mili-wand, if you like – and fix the borrowing issue immediately. Of course that isn’t possible – but it’s a far better alternative to the failed austerity programme. 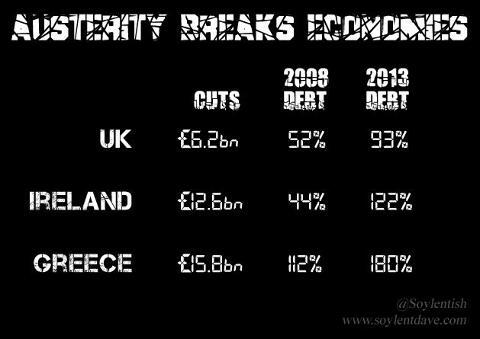 The statistics in the image (above) indicate clearly how disastrous austerity can be for a country, and of course Gideon Osborne’s main evidence to support this course was disproved a couple of weeks ago (I’m still waiting for you to bring forward other documentary evidence in favour of austerity, by the way, George). Meanwhile, the Liberal Democrats have climbed onto the Tory ‘negative campaigning’ bandwagon and decided that their best hope of winning votes is to attack the other parties. It’s a common Lib Dem ploy. So the Conservatives have abandoned compassion, and Labour is now a party of protest, according to Nick Clegg (who was clearly taking notes when Mr Miliband met former Labour leader Tony Blair). What a shame he didn’t pay attention to what Mr Miliband was saying. It’s ridiculous to suggest Labour is “offering anger rather than hope” when Labour has been telling everyone exactly how it would return hope to Britain’s blighted economy. Mr Clegg claimed that both Labour and the Conservatives were retreating to political extremes, and urged voters to vote for his party instead – conveniently forgetting that the Liberal Democrats in Parliament are currently an enthusiastic part of the most extreme right-wing government the UK has had in generations. What’s even more amazing is that he followed up this character assassination of his political rivals by saying that, in the event of another hung Parliament in 2015, he would gladly go into coalition with either of the other parties. He said the Lib Dems would “do our duty to the country”. Considering your track record to date, Nick, it seems unlikely that ‘duty’ has ever been your motivation. Is the algorithm method stopping my messages from multiplying? 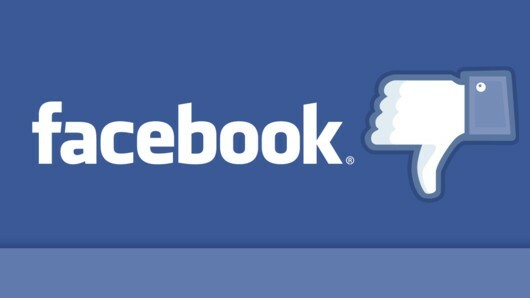 What is going wrong with the social media giant Facebook? By now, we all know that Facebook took it upon itself to target and attack bloggers – primarily with WordPress, as I understand it – who use the site to publicise their articles, last week. Vox Political was one of those sites. Anyone trying to ‘share’ a link with other Facebook users was subjected to the infamous and annoying ‘Captcha’ box – this is the time-consuming and difficult method of proving you are a human being by reading a series of letters or numbers, that have been stretched or bent on the screen in a way that we are told prevents automated ‘spam’ systems from understanding it, and then typing the sequence correctly into a box. This is off-putting as it takes time and effort, and many users may have decided not to bother. All this took place around the time the House of Lords was voting on the regulations that will allow private firms to compete to run NHS services – the privatisation of the NHS; and it also coincided with bowel cancer sufferer Mark McGowan’s crawl from King’s College Hospital to 10 Downing Street, pushing a toy pig with his nose to highlight his view that the privatisation marked out the Conservative-led government as pigs with their snouts in the money trough. I can’t comment on how this affected anybody else, but my own site certainly suffered as a result, and I complained to Facebook about this treatment, pointing out that the alert message clearly lowered me in the estimation of right-thinking members of the public generally, and caused me to be shunned and avoided – fulfilling not just one but two criteria necessary for an act to constitute defamation – otherwise known as libel. And that should have been the end of it, right? Well… were these automated systems malfunctioning again on Sunday and Monday? That would seem very strange behaviour, so soon after an initial ‘mistake’ that was so widely discovered, reported and discussed. Still, I posted an article yesterday and, when I checked this morning, found that – according to Facebook statistics – it had reached a total of 16 people. The previous article, a link to a reblog that I also posted yesterday, had amassed more than 1,700 readers (according to the stats). The article before that – more than 2,000. That was seriously odd, I thought. Nobody loses 2,000 readers in a day. Still, I had another article to promote, so I posted the link to “Tory department of dirty deeds swings into pre-election action”. Half an hour later – by which time I would normally have expected to see a ‘total reach’ in the hundreds, that number had stalled on two. Conspiracy-theory nonsense? Or a rational response to the evidence? I thought about this for a while. Then I decided to put it to the test. If Facebook is using spam-filtering algorithms to censor certain messages, then it must be programmed to detect particular words, or combinations of words, I reasoned. Maybe my use of “Tory” alongside “dirty deeds” was what got the article kicked into touch? So what would happen if I posted a link to the very same article, but this time with an innocuous – if unlikely – headline such as “Peace and harmony breaks out between the British political parties”? I’ll tell you what happened: ‘Total reach’ of 542 people within half an hour – that’s what! More than the original link – to the same article – had achieved all day. More than it has achieved as I type this, in fact. Maybe I’m being paranoid – Johnny Void thinks so; he’s been trying to convince me that this really was an innocent glitch, and I’d like to believe him. But I also want some solid answers. Wouldn’t you? I’ve written to Facebook; let’s see what happens. That ought to confuse this dodgy algorithm! The Nasty Party is at it again, spreading dire warnings about its political foes and trawling opponents’ appearances on the social media for anything it can use against them. Labour and – especially – UKIP candidates had better watch out; these are people who will take any apparently-innocuous off-the-cuff comment and turn it into galloping racism (for example) before your eyes! The Party of Smears kicked off in typical fashion yesterday by attacking UKIP as “a collection of clowns” in a protest party with no positive policies, that was primarily opposed to foreigners. The comment about being a party of protest will also ring in the ears of Labour candidates, after former party leader Tony Blair warned Ed Miliband that Labour must not be seen as one. According to the BBC, UKIP reckons it has evidence that Conservative Central Office is spreading smears about its candidates, after spending months trawling through the Twitter and Facebook accounts of anyone likely to be a candidate. Meanwhile The Guardian has reported a warning to Labour MPs from party vice-chairman Michael Dugher, that they will all be under “intense scrutiny” from the Tories for the next 18 months to two years, with Conservatives “scouring” opposition MPs’ Twitter accounts (and, we can well expect, Facebook pages) for damaging or embarrassing material. “The message was that while you might not be household names now, any slip can instantly make you one and do huge damage to the party. The next 18 months is crucial. 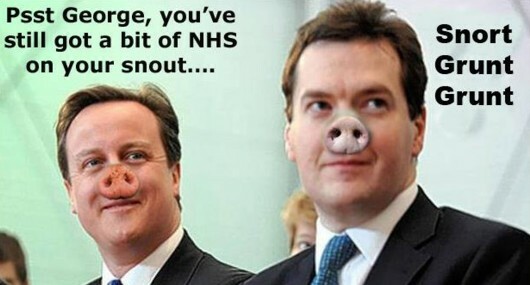 And the next few weeks are crucial ahead of the June spending review,” a ‘source’ is quoted as saying. 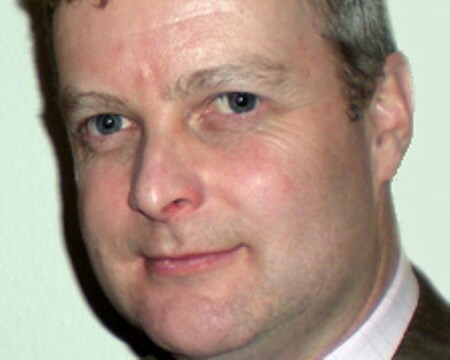 Facebook has already been the subject of controversy over alleged links with the Conservative Party, after blogger Tom Pride said he had been told by a Job Centre Plus employee that the Department for Work and Pensions had conspired with the social media giant to create a blackout around his blog because it criticised the Coalition government. That blackout spread to other blogs including Vox Political, in a bid to choke off critical political writing, with potential readers warned that sites “may be unsafe” in an effort to turn them away. Although initially successful, with hits on this blog suffering during the early part of last week, the attack was routed after Facebook users were told that they were being manipulated. Hopefully, visits to this site will soon be back to pre-attack levels. UKIP has taken the Tory attacks in its stride. The relatively young party has taken on nearly 2,000 candidates to contest the local elections on Thursday and has admitted it has not had time to check all their backgrounds properly. Therefore, the party says, it is glad the Conservatives are doing this job and has begun investigating six candidates over alleged links to the British National Party and other far-right groups. UKIP sources have also stated their certainty that, if they were to investigate Conservative candidates in a similar manner, they might find “even more examples” to use in a counter-attack, summing up the Tory tactic as “morally reprehensible and downright dirty”. “It isn’t scrutiny; it’s smear,” said a spokesperson. Of course, this fighting among the right-wing, minority-interest parties (and if you don’t think the Tories are a minority-interest party, you haven’t been following their policies for the last three years) should be very helpful to Labour. UKIP’s popularity splits the right-wing vote, meaning Labour has more chance to gain a majority in marginal council wards (and, by extension, marginal Parliamentary constituencies). At least, that’s one theory. The problem is the fact that Labour voters might decide to defect on Thursday, as well – maybe even to UKIP, despite the fact that that party’s position is further to the right than the Conservatives’. Much of this problem, Labour believes, lies in policy – with many people unaware of what most members of the Labour front bench actually do. And this is compounded, in my opinion, by the fact that the one policy area in which Labour’s position is known is such a cast-iron, vote-losing, disaster for the party: Welfare/Work and Pensions. Yet a Guardian article about a possible reshuffle makes no mention of Liam Byrne and his deputy Stephen Timms whatsoever – despite the fact that their decision not to oppose a blatantly illegal stitch-up of the system by the Tory DWP secretary Iain Duncan Smith enraged Labour heartlands across the country. Indeed, a fellow blogger recently headlined an article with the profanity (which I’ll edit here) ‘Liam Byrne f*ck off’. It is long past time that Ed Miliband told him to do so. If Labour does not abandon Byrne’s horrifying attempt to equal the Tories’ brutality towards Britain’s most vulnerable people, in favour of a new policy that attacks the causes of unemployment, sickness and disability rather than the symptoms, then Labour will lose the next general election. And that will be an even graver disaster for us all. I picked up the original image on a brief visit onto the Conservative Party Facebook page, where I passed a few choice comments on it – which appear below. I decided the correct information should not be wasted on the Conservatives alone, so I tried to share it on the Vox Facebook page. For a start, that deficit has been down by a third for a long time now. How much has it come down in, say, the last year? Less than a quarter of a per cent, according to my calculations. And in the last quarter? Even less. Businesses have not created more than 1.25 million new jobs – certainly not in the last three months! For a start, as we all know, 200,000 of them were education jobs that were simply transferred out of the public sector into private ownership to make ConDem figures look good. 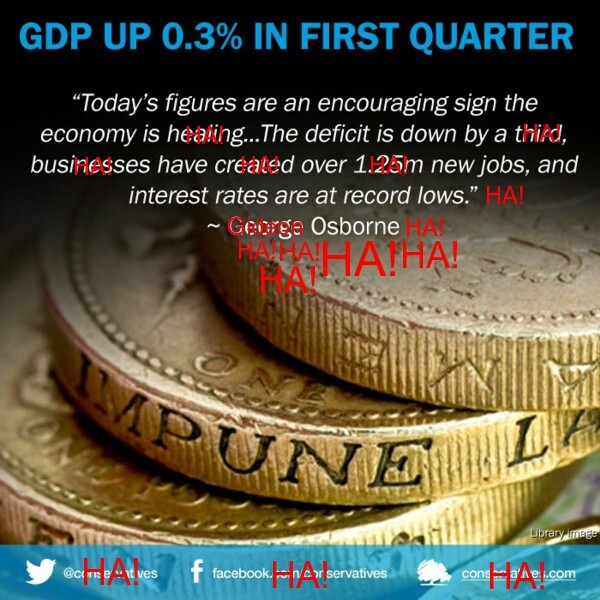 I haven’t seen any job creation figures for the last three months, but I doubt they’re as good as this image pretends. Interest rates are indeed at record lows, but this has nothing whatsoever to do with decisions by the current government. I notice that the only legible word on the side of the coins is ‘impune’. It’s a misspelling, but I take it as an invitation for all to come and impugn the lies we see here (Impugn: cast doubt upon or criticise as unreliable or unworthy of respect). “I used to be a nurse for many years. I trained under the old system before Project 2000. I’ve never worked as hard, been so tired or enjoyed a job more in my life. After training I went on permanent night duty in a busy A&E department in a smallish hospital. It was a great, friendly place to work and because during the night there were always fewer staff on duty we all supported and relied on each other. We would often have crazy busy nights when it got to around 5am before anyone got chance to sit down with a brew. We gave our all for our patients because that was why we were there and this fact alone was for me the reason why I got so much job satisfaction, despite the crap wages. “Then along came Thatcher and her divide and rule ‘quasi-market’ ideology for the NHS. Suddenly we were not all one hospital any more but an NHS Trust divided into Directorates. Staffing levels started to drop. We were instructed to order cheaper equipment such as substandard paper gowns with no sleeves in and nothing to tie them together at the back so patients felt exposed and embarrassed wearing them or the cheaper intravenous drip tubes made by some company connected with Tory MP John Gummer that somehow never worked properly…cheaper dressings, cheaper everything. “Each Directorate had its own nursing budget and the responsibility for this was devolved down to chief Nursing Officers (NOs). This had some perverse consequences such as the NO of the Medical Directorate who was responsible for the cardiac arrest team telling the NO of the Surgical Directorate she’d reached her monthly quota for call outs of the team so any further use of this service would have to come out of the surgical budget…a huge row broke out. Nurse was set against nurse and morale began to suffer. I have recruited 350 staff in the last year, including qualified nurses and midwives. Suspicious that this phrasing might cover a multitude of sins, I submitted a Freedom of Information (FOI) Act request to the hospital asking for details – both of the breakdown of the new recruitments and of unfilled positions at the Trust relative to its ‘funded establishment’ (the total number of positions it should be filling). Hoorah for the days when healthcare cost the earth and life expectancy was low! The graph reproduced above is from the Tax Research UK website, where it is being used to show that the Lords agreed to regulations that – in effect – privatised the English NHS last week, because of greed. 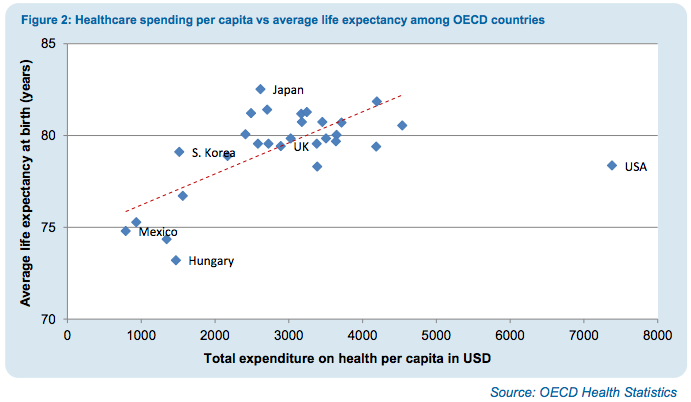 It shows the difference between OECD countries, based on the amount they spend on healthcare and the average life expectancy. Note that the UK is currently more or less in the middle of the majority group, with average spending and a fairly high life expectancy. By contrast, the USA is out on its own, with almost three times as much money spent on healthcare and a lower life expectancy (if only by a year). Clearly, the huge amount of extra cash spent on its private system does not lead to a huge improvement in health. So the question must be asked: Why is the British government determined to change our system – which, despite all the criticisms currently being trumped up against it, works – into one that is far more costly but produces slightly worse results? How will that improve the nation’s finances, for example? Considering that the poorer nine-tenths of the population would have a hard time stumping up the money for health insurance, it seems likely that we will see the return of some of the diseases that have been more or less eradicated from our shores for the last few decades, which leads to another couple of questions. Perhaps you would like to ask them on the doorstep, when canvassers come around in advance of the May elections. Firstly, do Conservatives and Liberal Democrats miss the old-time diseases like diphtheria so badly that they had to attack the healthcare system in order to bring them back? And also, if they really do miss those diseases, why not inflict them on their own social class, rather than on people who were quite happy with the system as it was? Does anybody remember the grotesque Harry Enfield character Loadsamoney? 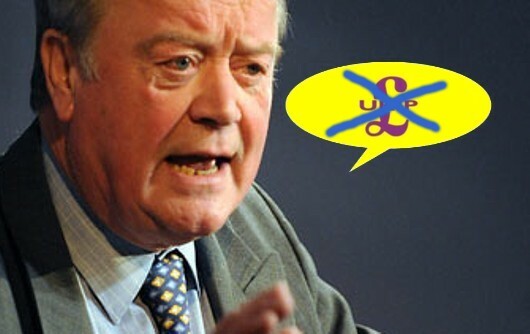 He was a walking, talking satire of the Thatcher era’s obsession with cash. When he first hit our TV screens, he was a plasterer, because they were making cash hand over fist at the time. Then the crash happened in 1987, and what did he become? Taking possessions away from people who were unable to stop it had become the growth industry, so that’s what ‘Loadsamoney’ went into. Now, bailiffs are once again salivating at the chance to get their hands on other people’s property. I predict that anyone with brains, who’s likely to get a visit from the bailiffs, will already be working out the home addresses of all those who run – or are employed by – local companies, and devising plans about what to do. After all, what have they got to lose? A British prison is better than the street. Over the next few months hundreds of thousands of people face losing their homes due to the Bedroom Tax whilst others will be driven into debts they can never pay by the endless tsunami of cuts to benefits. Already some companies are salivating at the prospect of dragging families from their homes and stealing the few remaining possessions of those with least. Little more than a privatised police force to protect the profits of bankers and landlords, bailiffs will be just one of the many sectors getting rich on the back of the brutal and shambolic welfare reforms. The Atos merry-go-round spins us into Hell again: This story is absolutely chilling. A man with serious medical conditions has been jailed – that’s right, JAILED – after an Atos work capability assessment. Read the story and quake in fear at the totalitarian regime that used to be the World leader in equality, justice and freedom of speech. 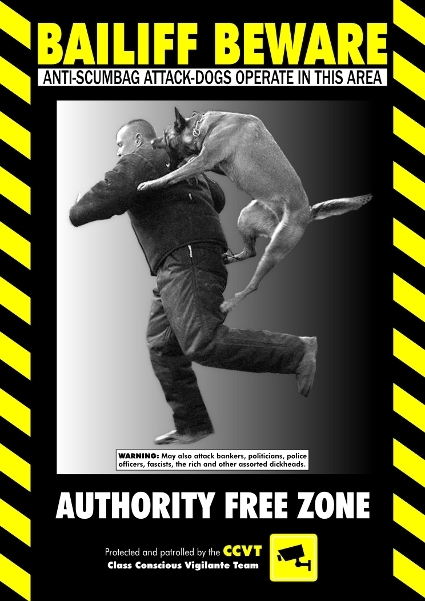 UPDATE 26/04/13 Steve Topley has been bailed, has pleaded guilty and is now expected to receive a community sentence. Seems he wasn’t such a threat to the community after all. A Nottingham man has now been held in custody for two weeks after he was accused of “threatening behaviour”* due to comments he allegedly made during his Atos benefits assessment. 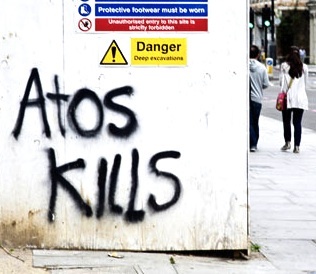 Steve Topley is a 49 year old father with multiple serious health problems who was required to attend a Work Capability Assessment with the notorious IT firm Atos – the company responsible for stripping benefits from hundreds of thousands of sick and disabled people. During the process Mr Topley made some comments about someone not present at the assessment.